BUSIA– The Electoral Commission released the electoral programme for by-election of District Chairperson and other Lower Local Government Councils in Busia District on Thursday. The Busia District Chairperson position fell vacant after court nullified the results of the 2016 Local Government elections. 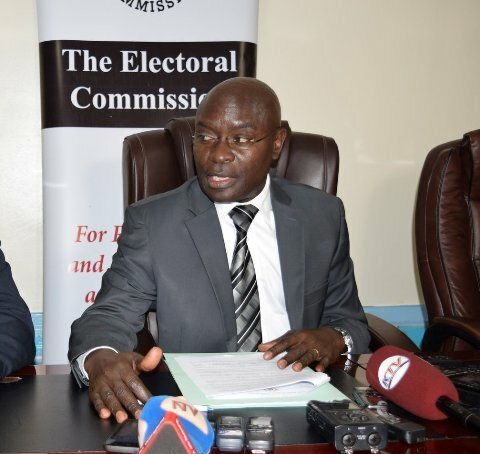 While addressing a press conference on Thursday, EC Chairperson Justice Simon Byabakama said that the programme will commence with an update of the National Voters’ Register from 18th to 22nd October 2018, at update stations in each of the sixty-eight (68) parishes/wards in Busia District. “The Commission has appointed Monday 22nd October 2018 as the cut-off date for registration of voters in the District. “Registration and transfer of voters from one polling station to another within Busia District will not be conducted after this date,” he said. According to EC, the display of the National Voters’ Register will be held between November 6 – 14, 2018, at all the 234 polling stations in Busia District. According to the commission, the nomination of candidates will be conducted for a period of two days, Tuesday 6th and Wednesday, November 7, 2018, at Busia District Headquarters. Candidates’ campaign meetings shall be held from November 9 – 24, 2018. Polling for elections of Special Interest Groups (SIGs) shall take place on Tuesday, November 27, 2018, and shall be by secret ballot by Electoral College at the respective sub-county/town headquarters. The polling shall start at 7:00 am and close at 4:00 pm. Polling for elections of District Chairperson and other Lower Local Government Councils shall take place on Wednesday, November 28, 2018, at all polling stations in Busia District. Justice Byabakama also declared that during the electoral process, no fundraising activities shall be allowed in Busia District but only in the designated areas. Even procession to hold campaigns on the roads will not be accepted as this may disrupt the Ugandans going about their businesses. He noted. Accordingly, the Commission invites written expression of interest from political parties, individuals and duly registered organizations and institutions who wish to observe the said processes. When asked why they are not organizing elections in the newly created districts, Justice Byabakama explained that the commission has no funds, adding that they have written to Finance Minister regarding the funds and the ministry has promised to look into the matter as soon as possible and if funds are availed to them, they will organize the elections. He noted that the commission has embarked on interfacing with local councilors with emphasis for them to ensure that there is peace and stability in their areas. Adding that the commission applied the tactic in Sheema elections and it worked and it explains the reasons behind the peaceful elections in this area. This exercise will enable Ugandan citizens of 18years and above, who either reside or originate in parishes/wards within Busia district, and who have not had their photographs and biodata taken before by the Electoral Commission for purposes of registration for elections, to do so. Voters are further urged to report to the display officer: the dead, the non-citizens, the under-aged, and those who belong to another Parish/ward so that they are removed from the Registrar. The commission will also display of voters’ Registers and Issuance of voting location slips: 6th-14th November, nominate candidates, inspect nomination papers, campaigns and polling day, accreditation of Election Observers.